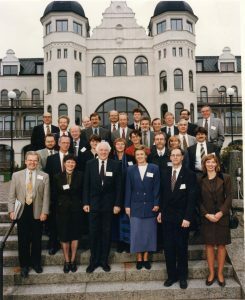 The fourth conference of ministers responsible for spatial planning and development of 11 Baltic Sea Region countries was held under the chairmanship of the German Federal Minister for Regional Planning, Building and Urban Development in Stockholm on 22 October 1996. It was organized back-to-back with the meeting of the Ministers of Environment of the Baltic Sea Region. implementation of common regional projects under INTERREG II C Initiative, supported by PHARE and TACIS and co-operation with INTERREG structures in the BSR. The conference document “From Vision to Action” summed up VASAB pilot projects and suggested further steps.